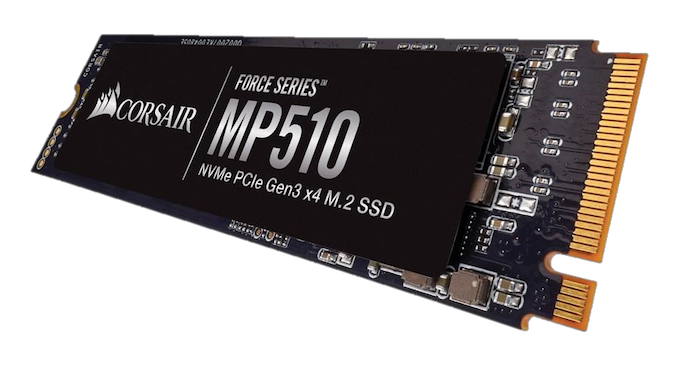 Today Corsair is launching the Force Series MP510 as their new high-end M.2 NVMe SSD. The MP510 is a big improvement over the preceding MP500, replacing the Phison E7 controller with the new E12 controller and switching from planar MLC NAND to Toshiba's 64-layer 3D TLC NAND. The MP510 is based on the Phison E12 reference design we tested a few months ago, with slightly improved performance and power efficiency. This makes it generally competitive with other high-end TLC SSDs, giving Phison customers like Corsair their first credible high-end NVMe SSDs. The performance, power efficiency, warranty and write endurance rating are all up to par for a high-end drive in today's market. However, with the Silicon Motion SM2262EN controller coming soon, 96L 3D NAND starting to ship, and possible new SSD announcements at a Samsung event tomorrow, the Corsair MP510 and similar Phison E12 drives are facing strong competition. The Corsair Force MP510 is currently available in capacities from 240GB to 960GB, with a 1920GB model coming soon. Our review of the 960GB model will be up later this week, but most of our benchmark results are already online in our Bench database. Wow, higher throughput, more IOPS, and cheaper then the Samsung 970 EVO?